Teamwork in trendy loft business coworking space. Young happy multiethnic creative employees brainstorm together 4K. Two multi ethnic colleagues work on architecture project in trendy loft office space, teamwork in the background 4K. Young happy beautiful multiethnic female colleagues discuss business by office table in stylish loft coworking space 4K. Happy female manager helps multiethnic colleagues, walks away. Teamwork and cooperation in modern trendy loft office 4K. Two young multiethnic casual colleagues work together in trendy loft office space, European female boss walking by 4K. 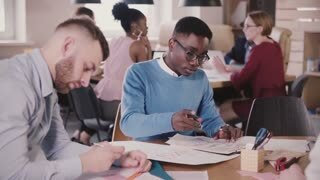 Two young business colleagues cooperate writing together on paper charts by the table in modern loft multiethnic office. Two multiethnic concentrated young colleagues work on data analysis in trendy loft office, teamwork in the background. Happy multiethnic business people collaborate in loft coworking. Friends enjoy working together in light healthy office.